Arabian philologist; born at Badajos (whence his name Al-Baṭalyusi = native of Badajos) in the second half of the eleventh century; died at Valencia in 1127 (compare Hartwig Derenbourg in "Revue Etudes Juives," vii. 274-279; Steinschneider, "Hebr. Uebers." § 156). According to the Arabian biographers, Baṭalyusi was head of the philological school at Valencia, where "his lectures attracted crowds of pupils" (Ibn Ḥallikan, ed. Slane, ii. 61; Ḥaji Ḥalifa, ed. Flügel, vii. 1666, No. 6259). Besides many works on grammar and philology, which are enumerated by his biographers, there is ascribed to him a philosophical treatise entitled "Al-Ḥada'ik" (The Orchard), on the resemblance of the world to an intellectual circle ("dairat al-wahamiyat"). This work, translated from Arabic into Hebrew by Moses ibn Tibbon under the title, "Ha-'Aggulot ha-Ra'yoniyot" (The Intellectual Circles), was edited by D. Kaufmann (Budapest, 1880), with a long introduction in which he attempts to show the traces of Baṭalyusi's theories in Jewish philosophy. In Kaufmann's opinion, Hai Gaon used Baṭalyusi's work, as appears from a passage quoted by Moses Botarel in his commentary on the "Sefer Yeẓirah" (iv. 2). Baḥya copied the very words of Baṭalyusi in speaking of the numbers ("Ḥobot ha-Lebabot," viii.). The expression "intellectual circles" ( ) is found in Gabirol's "Meḳor Ḥayyim" (Munk, "Mélanges de Philosophie Juive et Arabe," iv. 1). 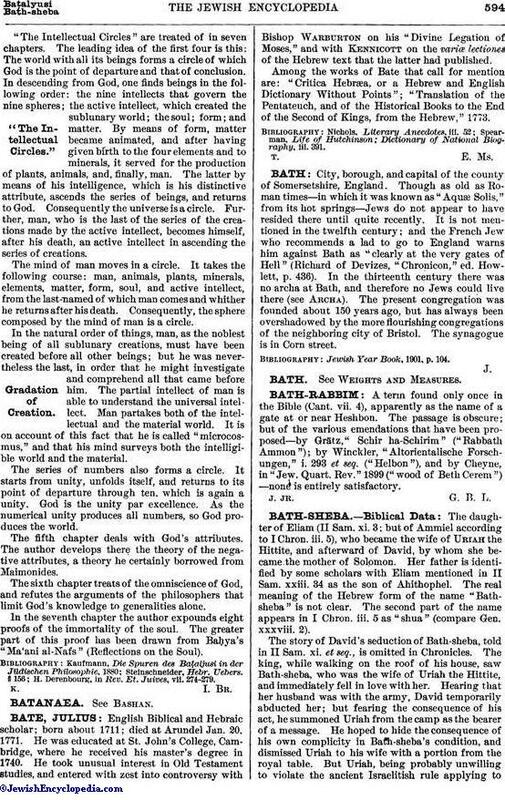 Judah ha-Levi expresses himself in a similar way to Baṭalyusi on the gradation of the intelligences ("Cuzari," ed. Hirschfeld, v. 20). Abraham ibn Ezra, in his commentary on the Pentateuch (Ex. iii. 15), takes the same view that Baṭalyusi does on the decimal numeration. Ibn Ẓaddiḳ speaks also of the symbolic signification of the numbers ("'Olam Ḳaṭan," ed. Jellinek, p. 49). Abraham ibn Daud was influenced by Baṭalyusi when he says that the nonexistence of the number one can not even be supposed ("Emunah Ramah," ed. Weil, p. 48). The whole system of the negative attributes, the theory of the omniscience of God, and the doctrine of free-will expounded in the "Moreh" are borrowed from "The Intellectual Circles." 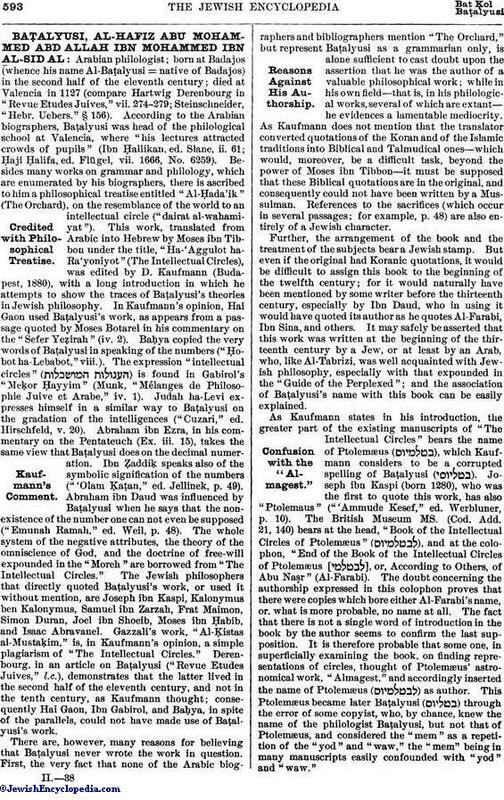 The Jewish philosophers that directly quoted Baṭalyusi's work, or used it without mention, are Joseph ibn Kaspi, Kalonymus ben Kalonymus, Samuel Ibn Zarzah, Frat Maimon, Simon Duran, Joel ibn Shoeib, Moses ibn Ḥabib, and Isaac Abravanel. Gazzali's work, "Al-Ḳistas al-Mustaḳim," is, in Kaufmann's opinion, a simple plagiarism of "The Intellectual Circles." Derenbourg, in an article on Baṭalyusi ("Revue Etudes Juives," l.c. ), demonstrates that the latter lived in the second half of the eleventh century, and not in the tenth century, as Kaufmann thought; consequently Hai Gaon, Ibn Gabirol, and Baṭya, in spite of the parallels, could not have made use of Baṭalyusi's work. There are, however, many reasons for believing that Baṭalyusi never wrote the work in question. First, the very fact that none of the Arabic biographers and bibliographers mention "The Orchard," but represent Baṭalyusi as a grammarian only, is alone sufficient to cast doubt upon the assertion that he was the author of a valuable philosophical work; while in his own field—that is, in his philological works, several of which are extant—he evidences a lamentable mediocrity. As Kaufmann does not mention that the translator converted quotations of the Koran and of the Islamic traditions into Biblical and Talmudical ones—which would, moreover, be a difficult task, beyond the power of Moses ibn Tibbon—it must be supposed that these Biblical quotations are in the original, and consequently could not have been written by a Mussulman. References to the sacrifices (which occur in several passages; for example, p. 48) are also entirely of a Jewish character. Further, the arrangement of the book and the treatment of the subjects bear a Jewish stamp. But even if the original had Koranic quotations, it would be difficult to assign this book to the beginning of the twelfth century; for it would naturally have been mentioned by some writer before the thirteenth century, especially by Ibn Daud, who in using it would have quoted its author as he quotes Al-Farabi, Ibn Sina, and others. It may safely be asserted that this work was written at the beginning of the thirteenth century by a Jew, or at least by an Arab, who, like Al-Tabrizi, was well acquainted with Jewish philosophy, especially with that expounded in the "Guide of the Perplexed"; and the association of Baṭalyusi's name with this book can be easily explained. As Kaufmann states in his introduction, the greater part of the existing manuscripts of "The Intellectual Circles" bears the name of Ptolemæus ( ), which Kaufmann considers to be a corrupted spelling of Baṭalyusi ( ). Joseph ibn Kaspi (born 1280), who was the first to quote this work, has also "Ptolemaus" ("'Ammude Kesef," ed. Werbluner, p. 10). The British Museum MS. (Cod. Add. 21, 140) bears at the head, "Book of the Intellectual Circles of Ptolemæus" ( ), and at the colophon, "End of the Book of the Intellectual Circles of Ptolemæus [ ], or, According to Others, of Abu Naṣr" (Al-Farabi). The doubt concerning the authorship expressed in this colophon proves that there were copies which bore either Al-Farabi's name, or, what is more probable, no name at all. The fact that there is not a single word of introduction in the book by the author seems to confirm the last supposition. It is therefore probable that some one, in superficially examining the book, on finding representations of circles, thought of Ptolemæus' astronomical work, "Almagest," and accordingly inserted the name of Ptolemæus ( ) as author. This Ptolemæus became later Baṭalyusi ( ) through the error of some copyist, who, by chance, knew the name of the philologist Baṭalyusi, but not that of Ptolemæus, and considered the "mem" as a repetition of the "yod" and "waw," the "mem" being in many manuscripts easily confounded with "yod" and "waw." "The Intellectual Circles" are treated of in seven chapters. The leading idea of the first four is this: The world with all its beings forms a circle of which God is the point of departure and that of conclusion. In descending from God, one finds beings in the following order: the nine intellects that govern the nine spheres; the active intellect, which created the sublunary world; the soul; form; and matter. By means of form, matter became animated, and after having given birth to the four elements and to minerals, it served for the production of plants, animals, and, finally, man. The latter by means of his intelligence, which is his distinctive attribute, ascends the series of beings, and returns to God. Consequently the universe is a circle. Further, man, who is the last of the series of the creations made by the active intellect, becomes himself, after his death, an active intellect in ascending the series of creations. The mind of man moves in a circle. It takes the following course: man, animals, plants, minerals, elements, matter, form, soul, and active intellect, from the last-named of which man comes and whither he returns after his death. Consequently, the sphere composed by the mind of man is a circle. In the natural order of things, man, as the noblest being of all sublunary creations, must have been created before all other beings; but he was nevertheless the last, in order that he might investigate and comprehend all that came before him. The partial intellect of man is able to understand the universal intellect. Man partakes both of the intellectual and the material world. It is on account of this fact that he is called "microcosmus," and that his mind surveys both the intelligible world and the material. The series of numbers also forms a circle. It starts from unity, unfolds itself, and returns to its point of departure through ten, which is again a unity. God is the unity par excellence. As the numerical unity produces all numbers, so God produces the world. The fifth chapter deals with God's attributes. The author develops there the theory of the negative attributes, a theory he certainly borrowed from Maimonides. The sixth chapter treats of the omniscience of God, and refutes the arguments of the philosophers that limit God's knowledge to generalities alone. In the seventh chapter the author expounds eight proofs of the immortality of the soul. The greater part of this proof has been drawn from Baḥya's "Ma'ani al-Nafs" (Reflections on the Soul). H. Derenbourg, in Rev. Et. Juives, vii. 274-279.